Before the arrival of machines, work that was too hard for a man to do was carried out with the help of trained animals. 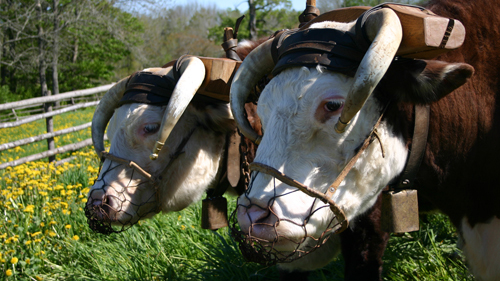 For thousands of years, the ox has helped do everything from cultivating crop land to moving buildings. 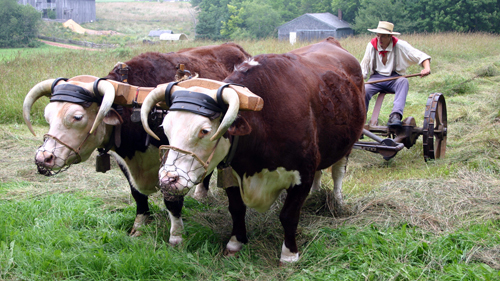 The domestic steer, a castrated bull, is trained to become a working ox. Castration (removal of the reproductive glands) is necessary so that the animal is less temperamental. The steer must then be trained to work before it is considered an ox. Cattle come in a variety of breeds. Certain breeds possess qualities considered desirable in an ox such as size and colour, physical strength and stature, or temperament and agility. The quality of an ox is determined by the training of breeds from which its stock has been derived. Breeding has brought many advancements in the use of domestic livestock. Early oxen were much smaller than today's show breeds. Likewise, the large, robust draft horses of today have only been in use for little more than the last century. Some people, however, refused to change from oxen to horse power, they felt the ox had some advantages over the horse. In rural areas, where the economy was underdeveloped and thrift was a away of life, oxen were cheap to feed, being able to graze most of the year and requiring a limited amount of grain. Their slow but steady power was easy on farm implements where sharp collisions with underground rock and stumps could damage equipment. Perhaps the most significant advantage over the horse was that when oxen were too old to be worked, they could be slaughtered for beef and sold or eaten.